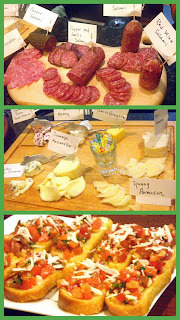 So, Cin Cin (toast) and Buon Appetito (Enjoy your Meal) to you all and let's Cook authentic Italian! This IS YOUR ITALIAN GRANNY's recipe... rich thick authentic and you even get a little history of why it's named after sailors. The Second Course... Actually served third after the Antipasto and the Primo, the Main Course, the meat course usually. "Salsa di Pomodoro alle erbe"
This is my go-to recipe for Italian Red Gravy... Your basic tomato sauce. Rich and thick and delicious. It is also my 9 month a year sauce, made with canned tomatoes (freshest possible in January). Very little hands on effort as the slow cooker does all the work! 52 Authentic Italian Recipes CROCK POT EASY Canning Ideas... This is the TRUE ITALIAN GRANDMOTHER recipe, perfect fresh tomatoes, add extra veggies (onion and peppers) and Italian spices and you have a GREAT SAUCE ... Can enough to last a year! It's much easier than you think and worth all the effort. 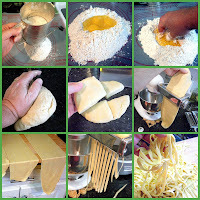 This is a basic recipe, perfect for linguine or to make artisan raviolis. Or even to pair with that tomato sauce above! A Soffrito is a vegetable mix, similar to a Cajun trinity or the French Mirepoix. The big change for me was the addition of a carrot in place of a bell pepper. Adds a delicious sweetness to soups, meat dishes and more. Freezes easily for a convenient quick lunch flavoring ingredient. Made in a Crock Pot (constant temperature control... plus it's easy), you just can not get far in Italian cooking without a good supply of Chicken Stock. SO, why not make your own. It's easy, it is cost efficient and you use up pantry items that are close to being thrown out. Make it with a store bought fully cooked, fully seasoned Rotisserie Chicken and you get all that meat FREE! It gets no better than this! 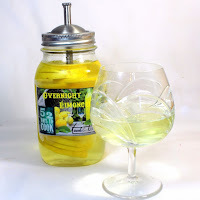 Very easy (I toss in the three tips that separate good from GREAT home made Limoncello. It does take patience as it takes 30 days for the oils in the lemon zest to infuse with the vodka but it is SO worth the wait. In the post I even toss in a couple recipes for Cheesecake, lemon bars and a few other ways I use mine. The Antipasto course sets the tone for a relaxed Italian meal. The meal starts with something to nibble on called antipasto which translates to "Before the Meal". Different from the Primo course. Smaller, light, nibble, grazing foods are best. Ideally you can serve this course away from the table, on the patio or by a roaring fire! Also an excellent time to be sure everyone is enjoying a little wine to set the tone. Pizza Making 101 with recipes for Dough, Sauce and all the Techniques for pizzeria restaurant quality pies at home! This is the classic "original" Italian pie made to honor the Queen Consort of Italy, Margherita of Savoy (and not the tequila drink). Breakfast Pizza, fast and VERY EASY and maybe the prettiest presentation for a pizza ever! Salty bacon and eggs cook on a classic cheese and tomato sauce pizza. Makes a unique breakfast and also works as an antipasto appetizer. The distinctive taste and aromas of sliced fennel bulbs highlight this unique citrus salad. Sicilian in origin, with an exotic sweet flavor typical of local pick and eat cooking style. Sound familiar, this is a seasonal dish that takes advantage of the winter availability of Blood Oranges. Dramatic presentation makes this perfect for a dinner party. Served Open faced, and made with eggs. Other than that, not many rules. Mostly the dish is used to make leftovers shine. A filling breakfast, lunch or a wonderful starter, easily serves 8 as an Antipasto. This is my delicious sausage and red onion Fritatta that I occasionally make as a weeknight no company dinner for two. A Firtatta can be more than just a way to use up left overs. In the classic Italian way, this is how to take the freshest best tasting ingredients (like a winter KUMATO TOMATO) and turning it into something simple BUT wonderful. Easy technique and the tomato shines! This is such a surprise... Seemingly a simple grilled cheese, but so much more. Seemingly a grilled cheese made with French toast, but so much more. More like a Bread pudding with a crispy crunchy outside, but the center is creamy almost custard like. BEST EVER GRILLED CHEESE!!! Parsley, Red Peppers and white meat Chicken turn the colors of the Italian Flag into this tasty delicious uniquely flavored chicken salad. PLUS, if you are looking for a mayonnaise less salad, this is for you... NO MAYO! The First Course... Actually served second after the Antipasto. This is the pasta or soup course. Rice, Risotto or polenta are all considered terrific Primo Courses! Get romantic with easy to do heart shaped pasta filled with a sweet Ricotta Cheese and bright bold colorful beets. The sauce is a gentle compliment with flecks of bright green adding to the look. But the taste is the winner! The third most popular sauce (after marinara and Alfredo), this is a bacon and egg noodle dish flavored with a sauce of bacon fat, cheese, herbs and mostly raw eggs! It is a delicious combination not to be missed. Easy one pot (well, two with the pasta) dish that comes together in minutes! This became my wife's favorite pasta... 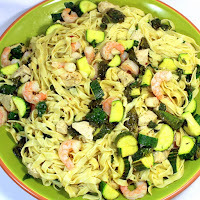 The Lemon sauce compliments the pasta, flavors the shrimp, perfectly pairs with the zucchini and wilts the spinach to perfection! Vodka is used to bring out the deeper richer tastes of the tomatoes used in this sauce. A long simmer releases an extra layer of flavor to create a bold flavor. Reinvented in the 70's at high end Italian restaurants, this easy to make essentially 30 minute meal is FANTASTIC to make at home. This is NOT the heavy thick cream sauce you may know from the Americanized version. Cheesy and creamy coating with a zesty lemon addition. Terrific sauce to use with fresh made pasta! One of my 52 Authentic Italian Recipes... Creamy Lemony slightly nutty cheesy Alfredo Sauce ... Fast and easy to make will set this pasta sauce apart. Kick in a little leftover ham and you have a meal fit for company! Once you go fresh made pasta you may never go back. Now I am starting to make flavored pasta with the black pepper added right into the dough. But the star is this incredible sauce. Butter cooked with fresh sage. Then Walnuts softened in the butter and big handful of Parmesan cheese makes this FANTASTIC! The dish is a combination of fresh made Pesto, added while making fresh made pasta and sauced with a nutty, cheesy sweet butter sauce! This is such a winner, such a mixture of flavors. The pasta absorbs the sauce, making the egg noodles chewy while the butter softened walnuts become almost meaty... Perfect for a meatless Monday! 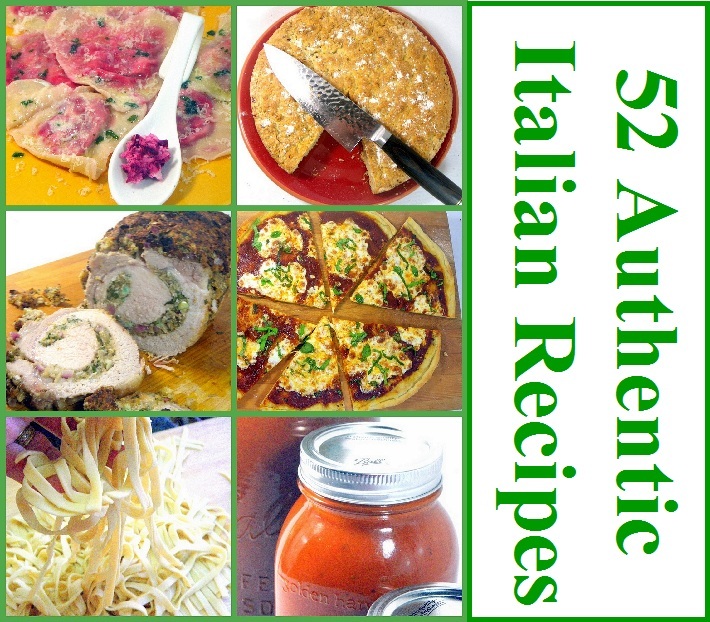 OK... You've probably heard the stories of an Italian Grandmother that can cook up a storm but never works from a written recipe. Well, this "recipe" is one of those. Most of the ingredients were in my pantry or were left over from earlier meals. Look around, bet you have what you need to make this... ready in 15 minutes! There is a simple cooking process that infuses the tastes of Italian sausage into a tomato sauce. making a richer fuller taste. Much more than just sauce and meat! All made set and forget easy in a crock pot slow cooker. Zuppa di FarroA MOST unexpected soup. DO NOT BE AFRAID OF THE SPELT. It is a grain, looks similar to barley BUT when slow cooked become sweet like a kernel of sweet corn. Combined with a SPICY Pepper Salami Soup, this becomes unexpected and FANTASTIC!!! I add a few tips to making a PERFECT Risotto every time. Just about any winter squash will work for this dish. The colorful sweet potatoes make this a standout for a beautiful and tasty dish. This is soooooo easy, and cheap. Especially if you make your own Herbed Tomato Sauce for Pasta, Pizza or Cooking! You are simply poaching the eggs in a tomato sauce, adding great flavor to the simple egg! This is the basic, scratch version... layer upon layer of Home made fresh PASTA (Recipe included), A rich thick meaty RAGU Sauce (recipe included), a nutty creamy BECHAMEL Sauce (recipe Included), Loaded with Mozzarella and Parmesan Cheeses and FANTASTIC! Newer Specialty or lesser ingredients are fine, but this is the ONE PEOPLE WILL RAVE ABOUT!!! A Deliciously delicate way to cook and then sauce your fish. Braised in butter, white wine and lemon juice, seasoned with simple salt pepper and a few Sage leaves. then the cooking liquid is thickened into a sauce that compliments the fish. Cook to proper internal temperature and the fillets melt in your mouth! It just does not get much better than this recipe. Olive Oil, garlic and Fresh herbs make this simple yet deeply rich flavors a specialty dish. Italians do not serve beef often, but when they do they make the most of it. Beef, it's whats for dinner. Start the marinade in the morning and this becomes a 30 minute meal. The "sauce" is actually diced tomatoes simmered in their juices along with pizza seasonings until the juices have simmered out and the tomatoes are deeply seasoned. Think a chunky BBQ sauce. Plus simple (best way to cook a steak) instructions for cooking the steaks. Simple seasonings, a few fresh herbs and braised in wine and stock, resting on a bed of Soffritto (minced root vegetables), this is NOT your Yankee pot roast. 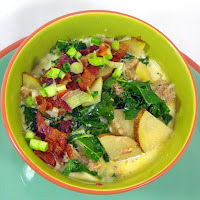 Simple with added flavors and you have a real winner of a heart warming meal! It's kind of the Italian version of boeuf bourguignon. Beef stew meat cooked long and slow in a dutch oven or cast iron skillet. Long and slow, braised in red wine, adding a delicious tart tang along with a natural sweetness. And the gravy comes pre-coating, simply delicious. A wonderful dish to make for a party, slow simmers in a milk bath for over an hour, giving plenty of time to work on side dishes and be a part of the fun. BUT, the combination of fork tender pork, sweet hints from the milk and a fantastic mustard milk gravy make this a winning combination. It's a beautiful spectacular presentation, but also a delicious way to add an herb soaked oil/wine marinade to the center of the pork, making each bite wonderfully moist, tender, seasoned and DELICIOUS!!! Breakfast food, or a delicious main course at night. Layered with pizza toppings (sausage tomato sauce and mozzarella), the layered custard bottom and the crispy French toast top makes this a more complex version of a southern bread pudding... and DELICIOUS! The legendary Chicken (Bone in, skin on) dish braised in wine and stock, flavofing the side dish of tomatoes and onions all in a single pot (Skillet). VERY VERY EASY and among the tastiest chicken dishes around! FAST (30 Minutes), EASY (One Pot Meal), PRETTY (look at the Green Peppers, Red Tomatoes, White Chicken), but most of all... TASTY! Chicken and Sausage, Onions and Peppers, all resting in a shallow pool of gravy, seasoned with Italian herbs ... TASTY INDEED, LICK THE PLATE TASTY! The Contorni course usually is not a course at all, but is served along side the Secondo (meat course). A Contorni is the vegetable or side dish. Often in modern times, there can be more than one Contorni served during a meal (a potato dish AND a dish of peas). 10 minute side dish. Think Asian Stir Fry with fresh Italian ingredients. So many layers of flavors here, highlighted by the colorful tomatoes and the beautiful colors of the Swiss Chard. Great side dish or vegetarian main course. Incredibly rich cheesy, fantastic Earthy flavor of the roasted Fennel. Sweet and herbal with the nutmeg accented creamy cheese sauce. A bit crunchy and soft and delicious. This Mediterranean classic, exotic ingredient dripping with Bechamel Sauce is INCREDIBLE! I LOVE THIS!!! LOVE LOVE LOVE! And so useful, breakfast leftovers, fantastic presentation fit for any dinner, a filling dish on it's own if you are going meatless. But it's that total taste that sends this to my MUST MAKE AGAIN SOON LIST! A littl oil, a few poatatoes, crisp them up and season with fresh herbs. A rustic but handy little dish. It comes together quickly and the crispy edges, yet tender centers seasoned with the fresh herbs pairs so well with a secondi (meat course). Sage is the seasoning and the potatoes are cooked in a tiny bit of oil PLUS bacon as the rendering bacon fat helps flavor the beautiful red potatoes. A colorful and wonderful side dish filled with flavor. These are the same potatoes as above. I chose to make these for a dinner party with 8 dishes being served. These are so wonderful and they have the advantage of no fuss, just bake, open the aluminum pouch and serve, freeing me up to work on the other dishes. Light, surprisingly light, very little flour, mostly eggs make this a delightful dessert after a full meal. The pastry cream is similar to the cream used in Boston Cream Pies. Rustic look but full flavor taste! A wonderful texturally almost shortbread cake that is wonderful to pair with a fruit (I like peaches). There is as much crushed toasted hazelnuts in the cake as sugar making for a rich full taste. It's not the legendary Biscotti you may know. Instead it is loaded with the pulverized Almond meal and candy coating of Candied Jordan Almonds. Buttery soft flavor added to the PACKED WITH ALMOND TASTE makes this a cookie to remember. Perfect as a dessert with wine or with your morning coffee! 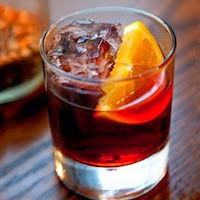 - A classic ITALIAN Cocktail making a huge comeback among Cocktail aficionados! Recipe for the classic plus links to 60 variations. Well, that's it for now, but rest assured there will be more coming soon.